20 ml polymeric bottle. Outer package - carton. Radical new combination of active ingredients enables to significantly reduce treatment period. The broadest spectrum of action on disease agents. Curative effect on otitis caused both by microbes and fungi. Provides anti-inflammatory effect, does not contain water. The drug contains 2% miconazole nitrate and 0.3% enrofloxacin as active ingredients. Drug active ingredients provide frank antibacterial and antifungal effect. Miconazole nitrate promotes fungicidal activity against fungi (including Candida spp., Aspergillus spp., Dimorphous fungi, Cryptococcus neoformans, Pittyrosporum spp., Torulopsisglabra) and bacteriostatic one against several gram-positive bacteria shedding in canine and feline otitis. Enrofloxacin (fluroquinolone compound) provides broad-spectrum antibacterial and antimycoplasmal activities, inhibits growth and development of gram-positive and gram-negative bacteria (including Streptococcus spp., Proteus spp., Stophylococcus spp. and Mycoplasma spp.). 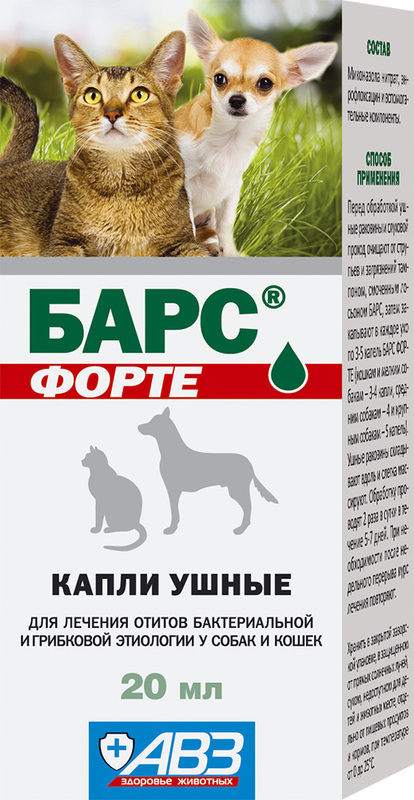 For treatment of acute and chronic canine and feline otitis caused by bacteria or fungi. Increased individual sensitivity to the drug components. Do not use for treatment of otitis in the setting of tympanic membrane perforation. Before processing clean animal conches and acoustic meatus from sloughs and dirt with a tampon with Bars Forte ear drops, then instill 3-5 drops in each ear (cats and small dogs - 3-4, medium dogs - 4, large dogs - 5). Middle animal conch and gently massage its base. Perform a processing twice a day within 5-7 days. Repeat treatment course in a week, if appropriate. Avoid violation of administration schedule because it may lead to decrease in therapeutic efficacy. Adverse events and complications are not observed in case of administration as per package insert. Fix animal head within several minutes to prevent drug splashing (if an animal shakes its head after drug administration). Protect from light. Keep out of the reach of children and animals. Store separately from food and animal feeding at 0-25°С (far away from heaters). Shelf life is 2 years from manufacturing date.